I had never seen anything like this before. 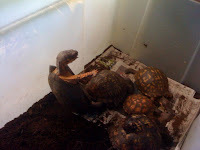 My son's daycare teacher (who happens to be his cousin ... long story) has turtles, and apparently they do this sometimes for 12 hours at a time. These two are believed to both be of the male species.